Something soft touches my tongue, but I do not dare to taste. I feel my hands going up to my mouth, taking the piece out of it. I quickly give it to my boyfriend next to me. His hands take the piece from mine and he puts it with an interested look into his mouth. I can see his jaws grinding, I hear a blissful “mmm” coming out from between his lips and I see him laughing politely. Not to me, but to the Koreans, dressed in bright colors, who are looking at us with great expectation. After having heard the sound of satisfaction, they nod back to us with the same kind satisfaction beaming from their faces. Cheerfully they murmur something in South Korean and turn around. I turn back to the person to whom I’d just handed over the piece of food. Miserably he looks at me and says: ‘This is truly the most disgusting thing I have ever eaten in my entire life’. I stare at him and grin. We are standing on top of one of the mountain peaks of Seoraksan National Park and are hiking in South Korea. Before the undefinable piece of food reached our mouths, we were doing marvelous. Red leaves follow the rhythm of the wind and the smell of autumn fills the air and our lungs. Until we take that bite. We are already traveling in South Korea for about three weeks and by now we are used to a lot. Not in terms of horrendous food experiences – because my god how delicious are the meals. No no, but in terms of South Korean hiking customs. And there are a few, I can tell you. Whether we’re in the middle of the busy city of Busan looking for the tastiest food stalls or on calm Jeju Island hearing the waves of the sea breaking on the shores: a mountain is never too far away in South Korea. 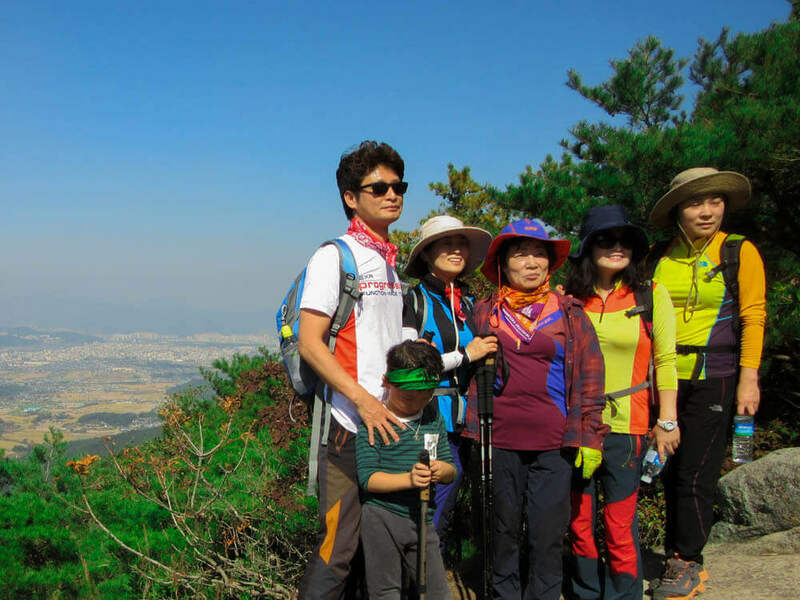 With a landscape that consists seventy percent out of mountains, it is not entirely surprising that hiking in South Korean has become common property. The small country has no less than 22 national parks, divided into historic, mountain and coastal parks. Parks where the inhabitants – and we who travel to their heart’s content – can discover nature on the ever trusty Shank’s pony. And so I ran like Pocahontas through the reddish brown leaves of the beginning of autumn. I felt the first September snow fluttering down on the tip of my nose – and of the mountain. And I danced as a forest elf between the rock carvings of a park that looked like a true open-air museum. And yes, of course you want to share all this pomp and splendor with all of your friends. 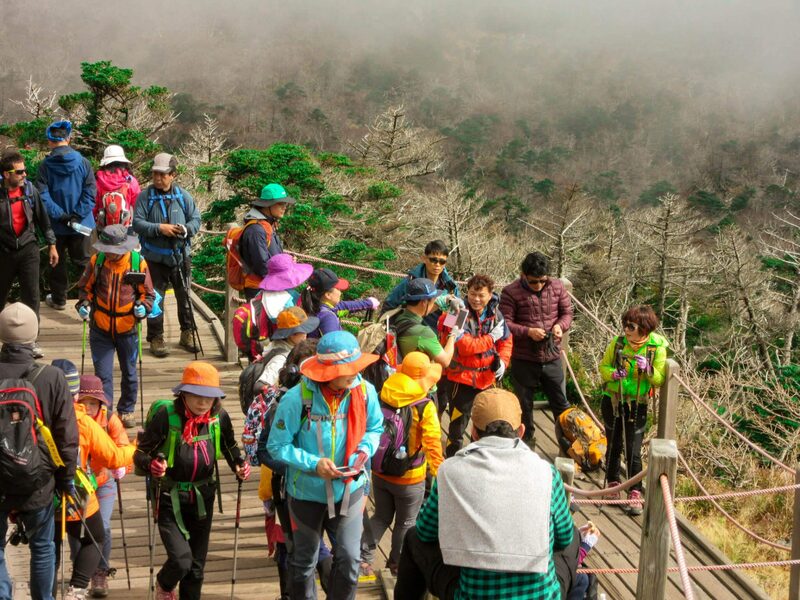 And so all year round the Koreans dive head-first in big busses that drop them off at the entrance of the national park of their choice, to climb the mountains together in overwhelmingly huge groups. A herd of antelopes got nothing on them. But hey, ‘the more the merrier’ is the rule when you go hiking in South Korea. I have never seen myself as a seasoned climber or hiker. I basically never do that in the Netherlands. Perhaps I don’t see rising to a level of up to 322 meters (the highest point in the Netherlands) as challenging enough. Or I’ve got the flat coast and south-eastern hills of the country already wired. But there is something about traveling that awakens the inner-hiker in me. Anyway, no hiker. And that means that I do not own any hiking gear. A good pair of walking shoes aside – which I purchased because of a trip around the world, when I realized that worn-out sneakers might not be the way to go. But that’s it. Now, in South Korea, I seriously doubt that there is anyone out of the more than 51 million people who do not have a complete walking outfit (or two) hanging in their closet. Because where we Dutch people often appear totally unprepared on stage – with aforementioned worn-out sneakers offering no grip whatsoever – or appear in nerdy matching zip-off pants, in boring colors, fleece pullover and hiking boots, the South Koreans make a true fashion show out of their walking adventure. A first look suggests that you are dealing with real pros, because everything is thought of. In the South Korean way. And that means color. Explosions of color. Synthetic fabrics, hats and sun visors. Rainbow backpacks and gloves. Pink jackets worn on top of shiny orange trousers with a green fisherman hat to finish it off. Or bandana. Or sun visor. Or all three. Worn by both women ánd men. Because hey, hiking in South Korea is more than letting your eyes roll over the beautiful mountainous landscape, the swirling leaves and glittering streams. It is looking at your fellow man. Looking at how the all decked out birds of paradise transform the walking path into a true catwalk. And that … is a true art. An art for which I will gladly tear my eyes from the landscape for a moment or two. So since the South Koreans went the distance to be all dressed to the nines, it’d be a shame if their body would give way half way through the journey. And so they combine the shimmer and shine of their outfits with walking sticks. No, no, hiking in South Korea is no small potatoes, I’ll tell you. At least, the way Koreans see it. The cheerful residents drag their metal buddies not only along when they have to bridge a significant difference in height. Also on Dutch-like flatter hikes you will see the bright sticks everywhere. Any policy regarding their use is of course totally absent and the risk of an astray walking stick in your eye is something you’ll simply just have to take for granted. But hey, if these attributes were really needed to reach the top… I’d understand. But in let’s say 90 percent of the cases this could not be further from the truth. Or am I now again that Dutchie who underestimates everything? While my feet move steadily along, it strikes me that the landscape is changing more and more. First it are the trees who throw their long shadows. A bit later it is the the wind in an open field that rinses over the slopes like a wave and that cools our bodies. The rumbling of gravel and stones under our feet changes into the crackling of planks. And the further we rise, the more we see the sun disappearing behind a cover of clouds that looks like a blanket lying on top of the mountain. 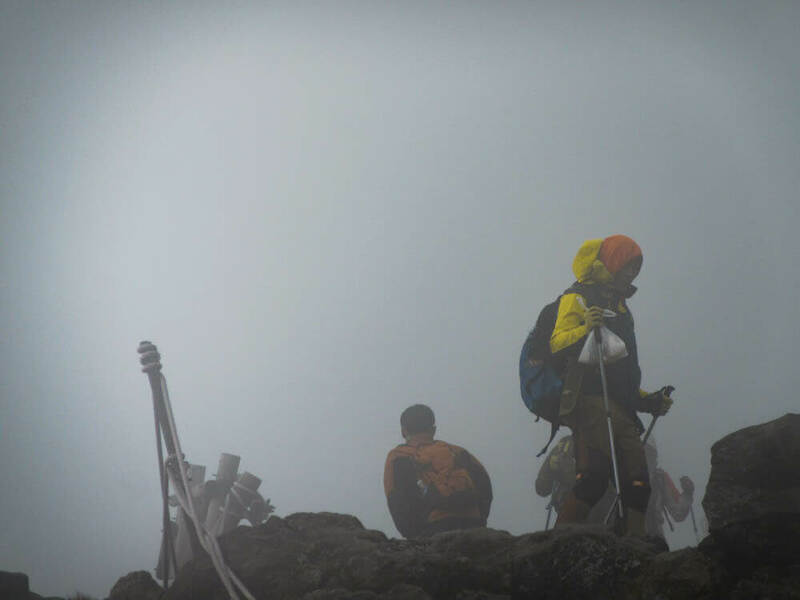 The road to the top is often one of continuous change and that keeps it exciting when you go hiking in South Korea. At most national parks your endeavor consists of a combination of walking over rocks on the flatter parts and climbing stairs on the steeper stretches of the route. This means limited ankle-spraying moments. You also do not have to be a walking-compass to find your way in Korean hikersland. In general the Korean walking routes are extremely well marked with options in both English and Korean – a few exceptions aside. Even at the sporadic moments that you really do not know the route anymore, the residents in their well-known groups are there ready to assist you. And so for us the obstacle called ‘a red-white barrier tape’ on Gyeongju Namsan Mountain changed into an opportunity to have a cultural exchange with the locals. 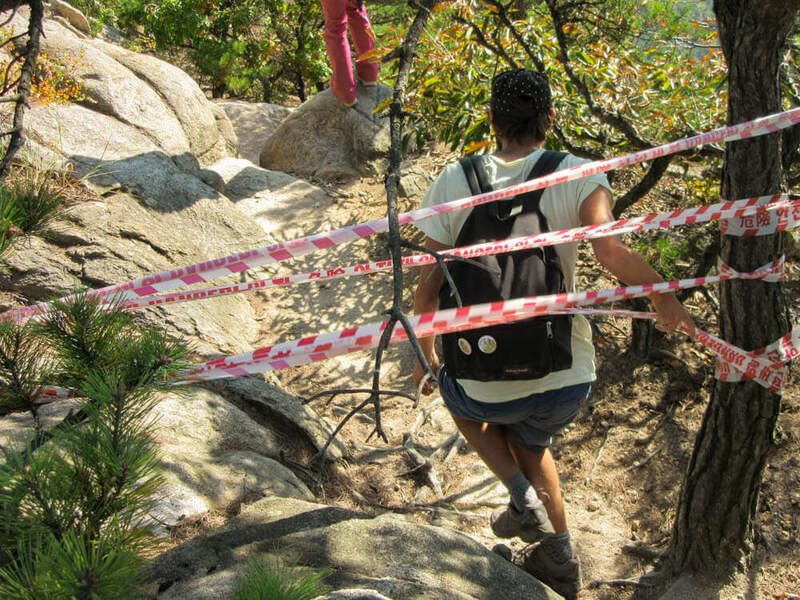 The warning tape, which made clear that the path was closed because of work in progress (this time only mentioned in Korean), was cheerfully held up for us and we were taken in tow. Not a word of English was spoken, but I am amazed again and again by how much you can achieve by simply using some made-up sign language and just one word of Korean: “Kamsamnida” (감사 합니다)! After having climbed at least 500 steps panting, I stand still for a moment. To my left I see the waves of the sea crashing on a shore that is kilometers away. When I look down, I almost think I can smell the sea, but what I actually smell is green. As soon as I turn my head, I see the climb that we still have ahead of us. I take a sip of a miraculous drink (see below), receive a pat on the back of my lovah-lovah and put the bottle back in my slightly-less-colored backpack than the Koreans walk with. Just as I pick up the pace again, a happy Korean comes down from the mountain. I see his hand going up and feel how mine automatically follows. With a vibrating clapping sound our hands touch in the air and my new Korean friend calls out ‘good climbing!’. And so many high-fives follow while hiking in South Korea. No matter how much you are struggling – or even if you are skipping the entire route – there is always a friendly Korean to encourage you. And while a high-five at such a moment is in fact nothing more than two sweaty palms causing the drops of exertion to merge with each other, within me I know it means so much more. Encouragements from complete strangers are my weakness. If during a running event a complete stranger calls out my name (as written in big old block letters on the paper stuck to my chest), my heart fills with joy. Add to that, that we are currently standing on top of a mountain, easily 8500 kilometers from home and I am moved in a way that a tear (not so) secretly appears in my eyes. Talk about being emotional. With exertion comes appetite. That is one thing they understand in Korean hikersland. In fact, nobody understands it as well as the inhabitants of this mountainous country. And so the Koreans won’t stuff a boring cheese sandwich in their rainbow backpack, but a true feast it does contain. With matching liquor stock. Let me tell you, you can definitely wake me up at 3 in the morning for some of that. The moments when I felt most accepted while hiking in South Korea were the moments where I pulled a bright green glass bottle of Soju out of my bag. Nothing but pride beamed from the eyes of my local fellow-hikers. 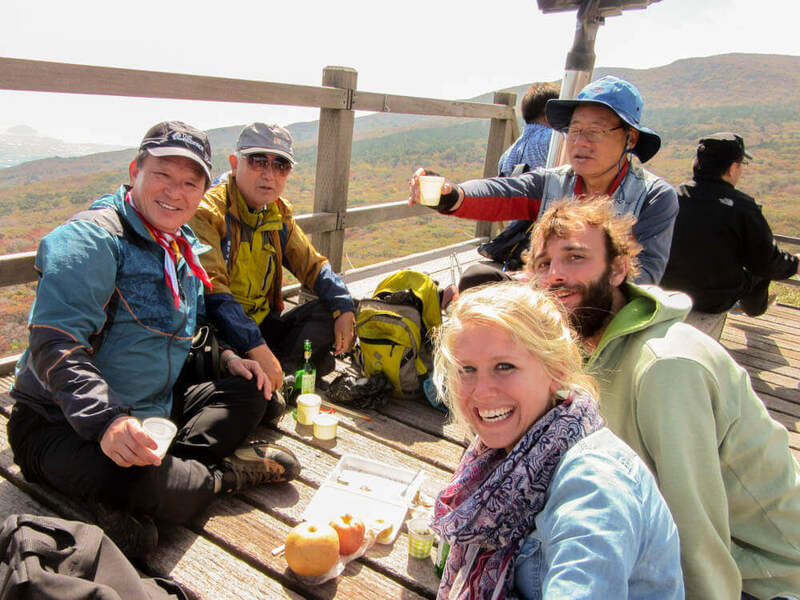 A Korean – or now ‘Annika in South Korea’ – hiking backpack is not complete without a bottle of Makgeolli or Soju. Especially the first is the typical drink that is consumed while hiking in South Korea. It is a white light sparkling rice wine. Personally I’ll always choose the transparent Soju above Makgeolli. Fortunately for me the South Koreans are very forgiving regarding your choice of drink. And when you take that sip as a reward for the long climb, it feels like an extra moment of victory. Like the champagne drivers spray over each other and the crowd after winning a race. Like the first flag that was planted on the moon. Like… well… a Soju after a strenuous hike. Cheers, mate! For those who are brave enough ‘to put on their naughty (walking) shoes’ – a joke/proverb-mistranslation reserved for my Dutch speaking audience – and do not have the aforementioned stock in their backpack: do not fear! The Koreans love to share their refreshments with you as a traveler. The delicious sounding greetings ‘annyeong’ (안녕) or ‘annyeonghaseyo’ (안녕하세요) are often accompanied by offering you a shot during your let-us-catch-our-breath moments. And it so happens that refusing a drink from an elderly person in South Korea is considered as being rude. So pick up that drink and glug, glug, glug. The smiles alone of your local co-hikers are worth the ‘effort’. The generosity of the Koreans is not limited to their liquor stock. The rest of the contents of their picnic-backpack they will also happily share with you. 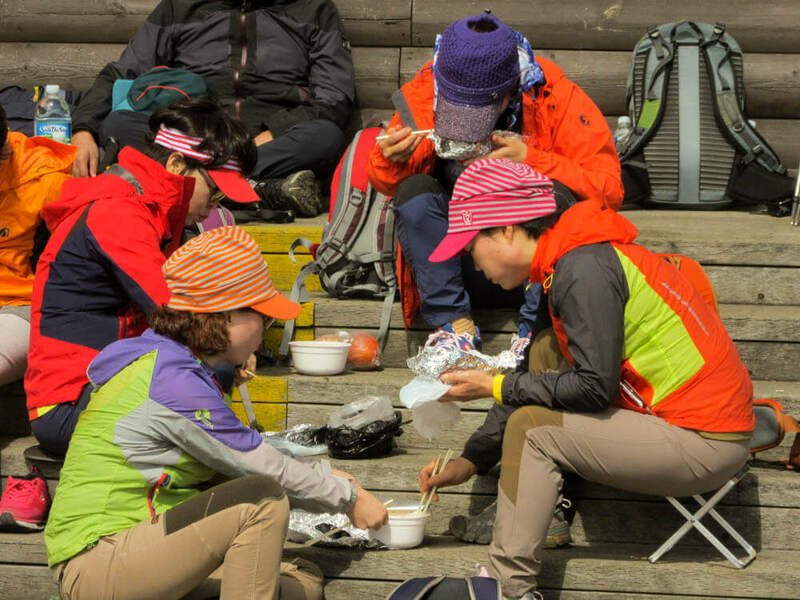 And that’s how’ll you discover even more of their delicious cuisine while hiking in South Korea. The highlight for us was the Jeju pork our fellow hikers gave us during a hike on – surprise – Jeju Island. Nom nom nom. And true, this means you’ll also run a certain risk while hiking in South Korea. If that risk occurs, then you’ll stand on top of a mountain with an already dried out throat. A throat in which a piece of dried fish has been pushed down by enthusiasm and politeness. But in most cases it will be a mind-boggling-stomach-satisfying experience. One where you’ll not only have tried a delicious new dish, but also one where you’ll have been part of the wonderful culture of South Korea. And with that risk, also next time I’ll gladly put that untraceable piece of food in my mouth. In good spirits and grateful that I can have a taste of their culture. 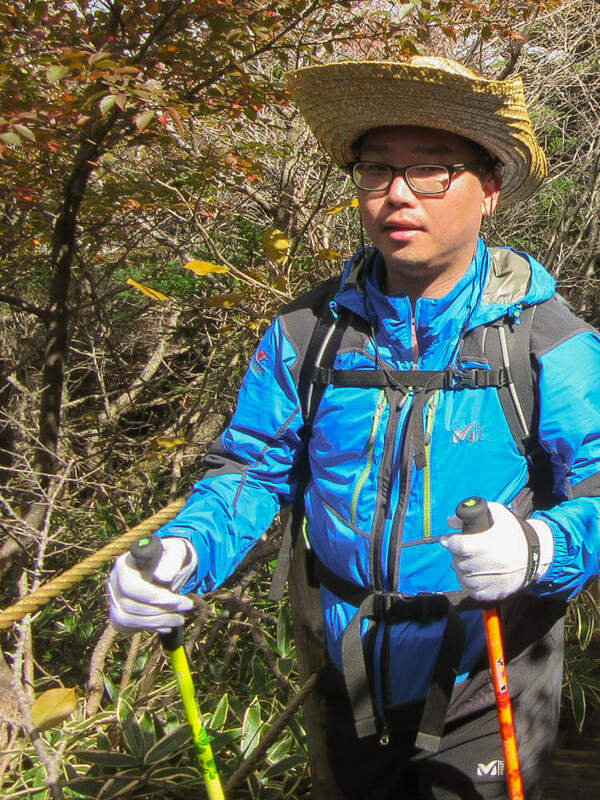 Do you also want to go hiking in South Korea? Great idea! On the website of the the Korea National Park Service you will find a very comprehensive overview of all national parks, including opening hours, entrance fees, locations and a piece of history. Nice to read and very informative!